Many of people like using Android phone but they wish to play the games or utilize apps that are only created for iOS users. However, many of us don’t know that there is a way to run different operating systems on your Windows computer. You can easily run the iOS apps on your Windows with the help of iPhone/iPad emulators. If you don’t know what they are, here are five best iOS emulators for Windows 10, 8 and 7 PC you should not skip. There are many benefits when using an emulator. Although they were initially developed to test apps and programs, their popularity in the general public is increasing daily. They can easily run on multiple devices. They allow the users to experience a different operating systems as they are not affordable to purchase. As Xamarin Testflight is created by Apple Corporation, so you will see so much similarity between the real iOS device and the emulator. It comes with a user-friendly interface and the advanced support and is very easy to install and download. However, it can only test apps on iOS 8.0 firmware and above. Air iPhone is another iOS emulator for Windows to replicate the iPhone’s user interface. But you will need the Adobe Air framework to recreate the iPhone’s GUI on the Windows in order to run Air Phone. As Air iPhone is not a fully functional app, so you see some differences over the real device when running apps. Moreover, some features are also missing in the Air iPhone emulator like the Safari Web Browser. One of the best emulators for iOS you should not skip is the iPhone simulator. 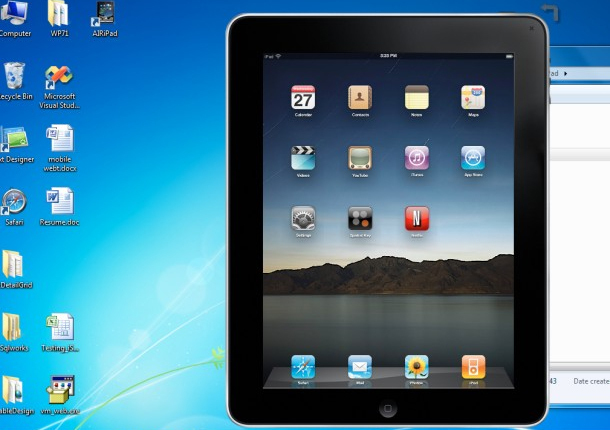 It allows you to access iPhone apps and games on your Windows PC. Purchasing an iPhone can cause a huge financial burden, but with the iPhone simulator, you can get benefit with the same experience. It is widely used by developers to track any bugs in underdeveloped apps. However, there is one disadvantage of the simulator is that you are not allowed to access App store and a few apps though the graphics and the user interface is similar to the actual iPhone. Ripple is another choice among very popular iPhone emulators for PC and Mac computers. It is widely used for testing apps and for the development of new apps. Ripple is only an extension on Google Chrome that allows you to run iOS apps right on the Chrome browser. Perhaps the best iPad emulator for Windows is IPADIAN as it brings a perfect experience of an iPad on your Windows computer. With this emulator, you can easily access to multiple Apple features such as Siri, iMessages, FaceTime and more. The user-interface is also friendly to use, which is why many users prefer use it above the others. We hope with these emulators you can access to the “much-hyped” Apple apps devices within minutes from your Windows computer. Fortunately, they are mostly free for use.